As plain and simple as it sounds, breastfeeding alone burns around 500 calories a day. It also releases a hormone called oxytocin which shrinks your uterus back to its normal size, helping your tummy lose the extra weight. This is an effective answer for how to lose baby weight. There is no better way to flush toxins after the delivery by guzzling down eight or even more glasses of water a day. Water fills your stomach’s capacity, therefore minimizing the extra food cravings you may have, which are common during this period. In those first few months, playing with the baby and keeping him/her active is crucial for boosting his/her development and motor skills. More than that, it will keep you up and about. Do some push-ups over your baby, press-ups or simply lift your baby up in the air. This will help you tone your triceps, and everybody’s happy! When stressed, don’t munch away your worries but instead sit down, close your eyes and practice deep breathing. Even taking out a few minutes from your crammed schedule to relax and stretch your muscles might prove the perfect sanity-saver. Instead of dining on fatty and sugary foods, switch to a healthy diet in the form of fibers. Not only do fiber-rich foods keep you feeling fuller for long, they are low in sugar and fat. Don’t overload yourself with fiber as it can absorb water from your body and lead to dehydration. If you still want to up your intake, make sure it is backed with lots of fluids. Run around the house as much as possible. Store the diapers on a different floor than where the baby’s room is. Instead of choosing the nearest bathroom, go long. 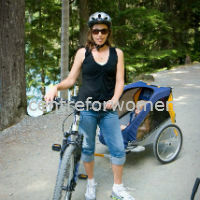 Go out for a stroll with the baby to learn how to lose baby weight. Start getting rid of your maternity clothing and replace it with not-so loose, fashioned garments that will motivate you to get in shape.